On Saturday, December 1, from 11:00 a.m. to 4:00 p.m., Margo Hamilton and Ron Evans of Studio Zero Photography will offer sittings for couples, individuals, and children for their modern take on the silhouette at James Monroe’s Highland. 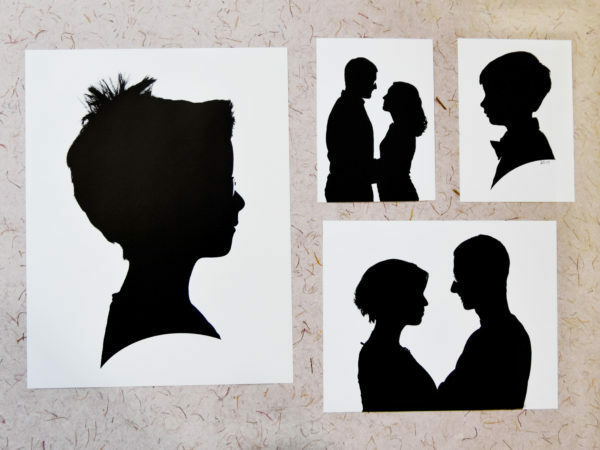 These silhouettes make wonderful holiday, birthday, and anniversary gifts. Studio Zero is waiving the $100 sitting fee for silhouettes made at Highland for one day only. This on-site offering presents significant savings while giving the opportunity to support Highland. Thirty percent of all proceeds will go toward educational programming at the historic estate of James Monroe. Option 3: 11×14 – $55 *This option will be mailed to you. Price includes postage. Payment must be made in person via credit card, cash, or check. Space is limited. Reservations are suggested, but walk-ups will be accepted. To reserve your sitting, click on the button below. Studio Zero Photography, a partnership between photographers Margo Hamilton and Ron Evans, is located at the historic McGuffey Art Center in downtown Charlottesville, Va. Margo and Ron are especially passionate about their silhouette photography and take considerable pleasure in bringing people joy through their unique creations. For more information about Studio Zero Photography visit their website studiozerocville.com.